If you're going to be out looking at the colors of fall this weekend, well ... you may be a tad disappointed. A summer drought means that the color intensity of this fall's foliage is not expected to be up to par through much of the country's Northeast corridor, according to NBC4 meteorologist Veronica Johnson. "There will not be a big 'wow' factor this year," Johnson said. So where can you see vibrant colors this weekend? 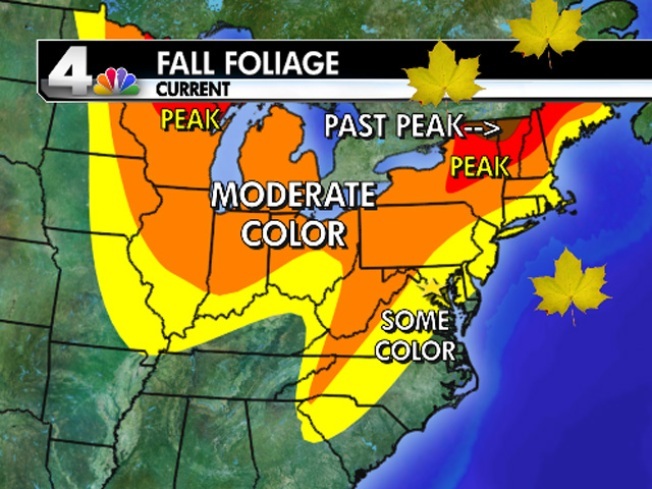 Leaves will be at their peak in the Catskills and Adirondacks. Johnson said there will be lots of good color in central Pennsylvania and the Poconos, and there will be moderate color just west of the Washington area along the Appalachian Trail, in West Virginia and in western Maryland. Next week looks like a better weekend for leaf-viewing in our area, Johnson said. "It's hard to predict the peak color this year because of weather conditions," Johnson said. "We're seeing sporadic areas of color based on the type of tree and how it performed during the drought." If you do find good color on leaves this fall, send your pictures to us and we'll showcase them on air and online. Send them to weather@nbcwashington.com.